November 07, 2017 "Information Clearing House" - Early this morning, Israeli Channel 10 news published a leaked diplomatic cable which had been sent to all Israeli ambassadors throughout the world concerning the chaotic events that unfolded over the weekend in Lebanon and Saudi Arabia, which began with Lebanese Prime Minister Saad Hariri's unexpected resignation after he was summoned to Riyadh by his Saudi-backers, and led to the Saudis announcing that Lebanon had "declared war" against the kingdom. As is already well-known, the Saudi and Israeli common cause against perceived Iranian influence and expansion in places like Syria, Lebanon and Iraq of late has led the historic bitter enemies down a pragmatic path of unspoken cooperation as both seem to have placed the break up of the so-called "Shia crescent" as their primary policy goal in the region. For Israel, Hezbollah has long been its greatest foe, which Israeli leaders see as an extension of Iran's territorial presence right up against the Jewish state's northern border. The Israeli diplomats were instructed to demarch their host governments over the domestic political situation in Lebanon - a very rare move. The cable said: "You need to stress that the Hariri resignation shows how dangerous Iran and Hezbollah are for Lebanon's security." "Hariri's resignation proves wrong the argument that Hezbollah participation in the government stabilizes Lebanon," the cable added. The cable instructed Israeli diplomats to support Saudi Arabia over its war with the Houthis in Yemen. The cable also stressed: "The missile launch by the Houthis towards Riyadh calls for applying more pressure on Iran & Hezbollah." 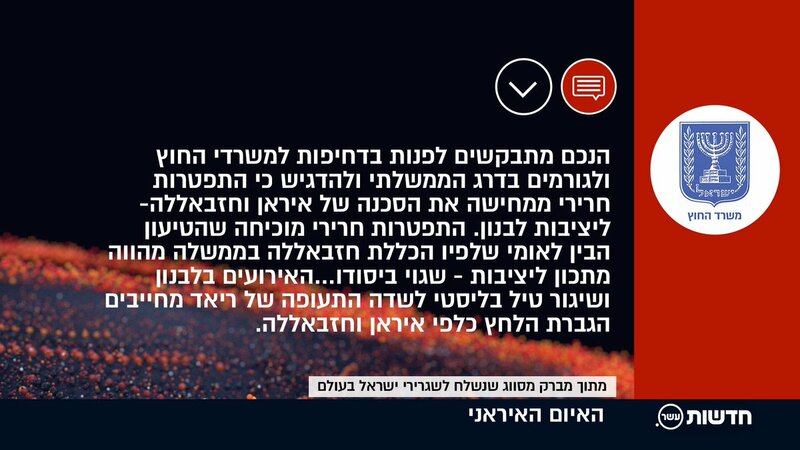 Watch today's Hebrew broadcast Channel 10 News report which features the Israeli diplomatic cable - the text of which is featured in Channel 10's screenshot (below) - here. "To the Director-General: you are requested to urgently contact the Foreign Ministry and other relevant government officials [of your host country] and emphasize that the resignation of Al-Hariri and his comments on the reasons that led him to resign illustrate once again the destructive nature of Iran and Hezbollah and their danger to the stability of Lebanon and the countries of the region. Al-Hariri's resignation proves that the international argument that Hezbollah's inclusion in the government is a recipe for stability is basically wrong. This artificial unity creates paralysis and the inability of local sovereign powers to make decisions that serve their national interest. It effectively turns them into hostages under physical threat and are forced to promote the interests of a foreign power - Iran - even if this may endanger the security of their country. The events in Lebanon and the launching of a ballistic missile by the signatories to the Riyadh agreement require increased pressure on Iran and Hezbollah on a range of issues from the production of ballistic missiles to regional subversion." Thus, as things increasingly heat up in the Middle East, it appears the anti-Iran and anti-Shia alliance of convenience between the Saudis and Israelis appears to have placed Lebanon in the cross hairs of yet another looming Israeli-Hezbollah war. And the war in Yemen will also continue to escalate - perhaps now with increasingly overt Israeli political support. According to Channel 10's commentary (translation), "In the cable, Israeli ambassadors were also asked to convey an unusual message of support for Saudi Arabia in light of the war in which it is involved in Yemen against the Iranian-backed rebels."